In this review of the Totesport betting app we will be telling you everything you need to know about Totesport who are a British bookmaker that are owned by Betting giants Betfred. Totesport has over 500 high street shops and over 4,000 employees. Totesport are a popular British Bookmaker who were owned by the UK government from 1928-2011. In 2011, Totesport were sold to Betfred who made some drastic changes to the company. Since Betfred’s take over, Totesport have managed to launch a mobile app which features many brilliant markets and a fantastic sportsbook. Totesport are established pioneers in the industry of online mobile betting and they are extremely well-known. When the Totesport betting app was launched, business increased rapidly for the company and Totesport saw huge amounts of punters joining to bet with them. The layout for the Totesport app is quite good in my opinion, the layout itself is simplistic however everything is laid out well and there are plenty of options for users to select from. Another great thing about the Totesport app is how easy to navigate it is. The app itself is very easy to get around on and this is certainly a great aspect. In terms of app features, there really are so many on the Totesport app! To give you an idea on what type of features to expect on the Totesport app, we have decided to create a small and informative list. Huge Rang of Markets – There really are so many options in terms of sports betting to choose from when on the Totesport app, this includes all the sports that are available to bet on and also the different types of bets. Customer Support – Customer support is an essential feature and Totesport have ensured that customer support on their app is of a high standard, there are various methods of customer support that users can select from if there are any issues or queries in regards to the Totesport app. Payment Methods – Payment methods are another crucial feature in the world of mobile betting, Totesport have made sure that they cater for a wide audience as they accept a good range of payment methods so that punters will have no issues when it comes to payment. Totesport accept Visa, Maestro, Mastercard, Skrill, Neteller, Pingit, Apple Pay, Paysafecard and PayPal. 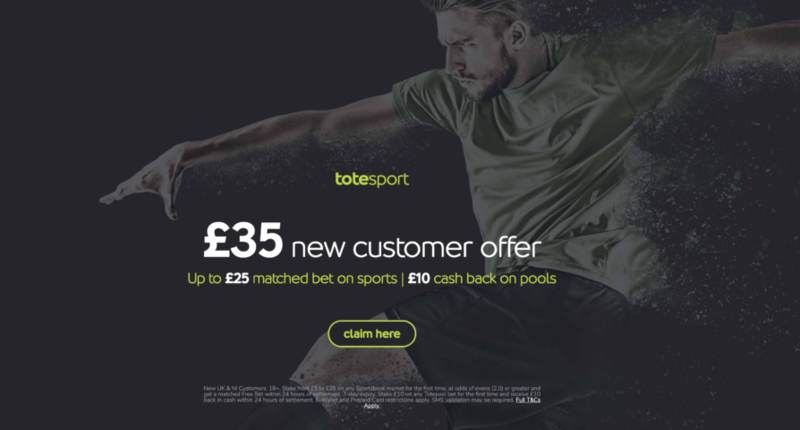 Totesport have been in the betting industry for a very longtime and because of this, the majority of people look at them as a reliable and safe company. Due to their high ratings and popularity that they have received, many people want to bet with them. Totesport offer plenty of brilliant offers and bonuses to new punters and this is another key factor which attracts new potential customers. The best welcome offers can be found on the home page and will appear as soon as the user logs onto the Totesport betting app, if users want to check out other offers and bonuses then just simply need to go onto the ‘promotions’ page. Totesport are renowned for sports betting and the exceptional markets that they provide to punters in sports betting. The most popular sport that people bet on when on the Totesport app is Football. Football betting is massive, and it is also the case on Totesport too! Once the user selects the Football betting option on the Totesport app, they will instantly come across all of the current and upcoming football fixtures which are available to bet on as well as the odds, leagues, teams and offers. There are many leagues and competitions to bet on when on the Totesport app, some of the most popular ones that punters choose to bet on are the FA Cup, Premier League, Champions League, Club World Cup, Bundesliga and La Liga. Once the user is on the Totesport app and selects the In-Play tab they will notice all of the fixtures and events that have the in-play feature available. Badminton, Ice-Hockey, Football, Darts, Cricket, Baseball, Aussie-Footy, Volleyball and Basketball all have the in-play feature. Cashing Out is available for users to take advantage of on selected sports once they have placed their bet on the Totesport app. The Totesport betting app is extremely popular and is highly rated, users must be over 18 to download the app and it is available on Android devices such as Samsung and HTC as well as iOS devices too. Users can either go and download the app straight from the Totesport website or they could alternatively just download it from the app store if they have an iOS device or the play store if they have an Android device. Totesport have managed to create an app that is different from the rest and that is why I am a huge fan of it. The layout and colors that have been used are quiet unique and different, the markets that are offered are great too as there are so many for users to choose from which means that users will not run out of options and certainly can’t complain about a lack of choices! If you are after a reliable and popular betting app with wonderful markets and plenty of bonuses, then the Totesport app may well be the one for you!